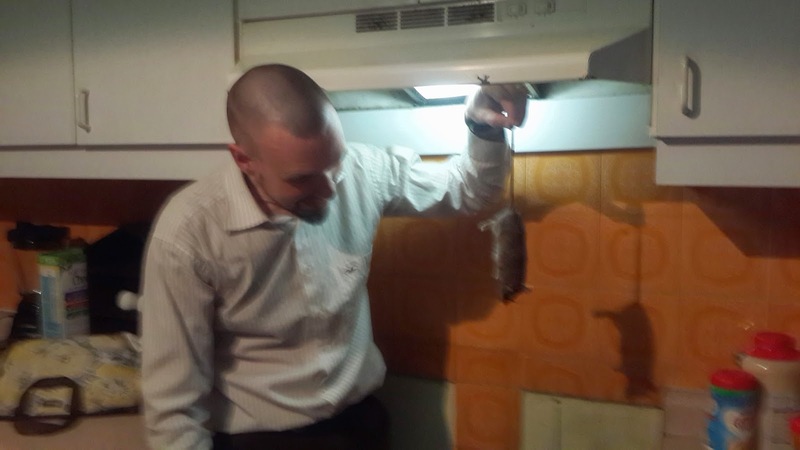 Operations against the mouse were activated the night of February 23. Our kitchen looked like a battlefield. 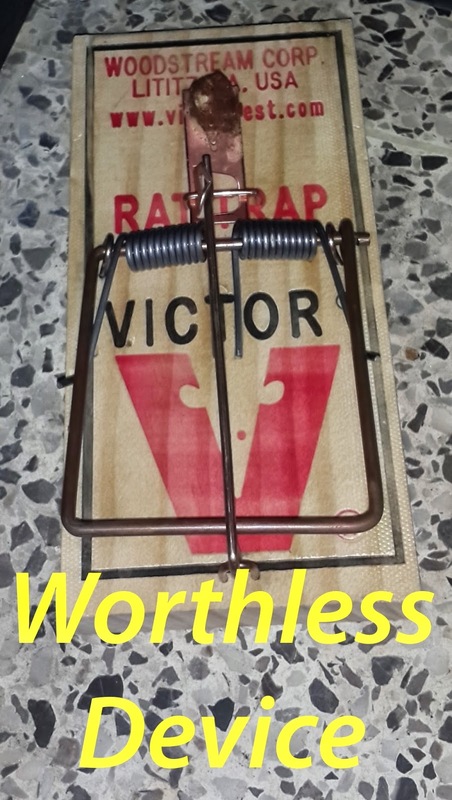 I had made a special trip to Novex, the local hardware store, and purchased one large rat kill trap, 2 mouse kill traps, and two rat glue boards. Kellie had already purchased two live mouse capture traps, and a live catch contraption made of chicken wire and a lever. Peanut butter was spread on all the triggers and placed in the center of the glue traps. The mouse eluded the strike of one of the small kill traps and ate the peanut butter. All other traps were left alone, and the mouse ate a banana on the countertop. Thus began an 18 night mind game with a mouse... that outsmarted me every single night. After the initial escape from a kill trap, he wouldn't touch the others. My friend Antony recommended tomatoes, and so I set a kill trap with a tomato. The mouse avoided that trap, found a whole tomato on the other side of the counter, and ate from it. The mouse had never before touched the tomatoes on the counter. I was convinced he was now taunting me. I tried bananas. Again, the trap was like a suggestion to him. He ignored the bananas on the trap and went for bananas in the pantry. The kill traps were useless. I even tried precious Nutella. He twice escaped glue traps. I woke to find the a glue trap two rooms away from where I'd set it. I flipped it over to find 3 mouse poopies, and lots of fur stuck across it. He'd dragged and clawed his way off. I now began to respect the mouse. About a week into the operation, a glue trap successfully snared an animal... Remus the dog. He came dragging it into the room with a shamed dog posture. It took patience from both of us to remove the board. A day later he did it again. Worthless dog! The mouse is making us both look foolish. At this point I had all but conceded defeat. I'd set out the traps, moving them to areas of the mouse's recent activity, and he would avoid the trapped area, ransacking another. He found his way into our baking cabinent and wrecked supplies that had been hand delivered from the U.S. Active pursuit was failing, the mouse was winning. We'd see him run across the floor, or peek out at us from around corners and under cabinets. We'd find and clean out his stash, in drawers, under cabinets, in the pantry, behind the dishwasher. He was hoarding dog food. The smell of his urine would lead us to the nests. We made efforts to cut off his food supply. The dog was on ration, eating small amounts in single sittings with the excess removed. Bread and all food supplies had to be sealed in containers. We were careful to leave no crumbs, no dirty dishes. And yet the mouse continued to win. He'd find clever ways to still access food. I was now humiliated by him. He would stare at me from across the room with his twitchy nose and ridiculously long tail. I felt like he was sizing me up. He'd disappear into thin air when I tried to pursue him. He'd also crushed the spirit of Remus. The dog no longer tried to pursue him. So me and the dog would just watch him move along the edge of the walls, avoiding all glue traps and going around the kill traps. Meanwhile, he was getting huge. We had fed him well. Finally I just stopped changing the traps. It was pointless. I finally resorted to buying poison and setting it along all his routes that he'd tagged with mouse poo. He avoided the poison. Somehow I had Einstein the Mouse. We had a dinner appointment on Wednesday, the night of the 12th. I was upstairs when I heard Aleksandra coming my way, "Dad, come downstairs now! The mouse is trapped in the corner!" In this moment I did not want to be Dad. I knew I'd go down to the kitchen with everyone watching and get outsmarted by my nemesis one on one. To this point, we had not gone head to head in a direct confrontation. I really didn't want to. I just wanted him to fall into a trap! Reluctantly I slowly went down the stairs to do my duty. I was hoping he'd escape before I arrived. No such luck. I went down to the kitchen and the entire family was staring into the corner of the countertop. Behind the coffee maker I can see about 3 inches of his tail. In front of the coffee grinder was his familiar face, beady eyes, and twitchy nose. He was staring me down. He was huge. He wasn't a rat, but he was the biggest mouse I'd ever seen. From the tip of his nose to the end of his tail, was a good 12" span. And he was fat! I was hoping maybe he had finally eaten some poison and was maybe near death. Maybe he couldn't run. Kellie handed me two plastic food storage containers and I sat one in front of him and brought the other one around behind him. I started to close in on him. Suddenly he shot out from his position, evaded my effort to trap him, and escaped behind the stove. This mouse was fully operational and battle ready! Now my adrenaline was pumping and I was ticked off. He bested me head to head in front of my family. I pulled out the stove and he was gone. I dropped to the ground, opened the bottom access and peered in. No mouse. I stood back up and noticed a hole in the adjoining cabinet. I began opening cabinet doors and ransacking the insides. I moved from one to the next, knocking aside pans, spilling containers, and looking generally insane as I trashed our kitchen searching for him. I wanted to crush him. Nothing. The cabinets were mouse free. I turned to see everyone watching me as I knelt in a pile of pans and food. I shoved it all back in and walked back over to push the stove in. I peered to the back to make sure the gas line wouldn't be crimped... and there he sat in the corner. I couldn't reach him. The stove wouldn't come out any further due to the shortness of the gas line. My mind began to race... this wasn't over yet. I needed something long, maybe I could slam it down on him. There was nothing nearby. I considered running outside to get a shovel (remembered I don't own a shovel), considered a broom, but I didn't like that idea either. I leaned back in frustration and in that moment I noticed my red thermos. I had purchased it at a Kroger years ago, and it was one of very few kitchen items of mine that came with us. I reached for it slowly. I positioned it directly over the mouse and realized the gas line was in the way. I had to reach with the other hand... slowly... and move it aside. The mouse was still there, about 4 feet below the thermos I was holding above him. I relaxed my fingers and let gravity take the thermos from my grip. To my absolute shock it was a perfect hit, coming down on his head with a clunk. 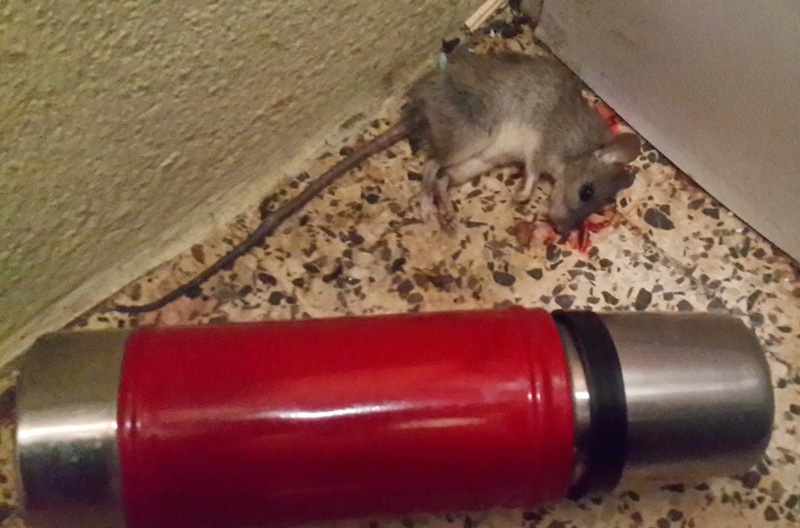 The thermos fell sideways and the mouse lay on his side, back legs and tail twitching. I had a direct hit! I didn't say anything to my family behind me just yet, because I feared he would suddenly jump up and shoot through the hole in the cabinet, or run under the stove. His body continued to twitch. I was sure he was about to jump up... and then blood began pouring out from his mouth. It was a bit shocking how much blood came out of him. I was a little repulsed, and I even felt bad that he was dying hard. This mouse was smart. He had beaten me for over 3 weeks. I felt a respect for his passing, and found myself talking to him, "just let go Mr. Mouse, be at peace, don't fight it, just pass on." My family was behind me observing all this in silence, not seeing the growing puddle under the mouse. I thought of learning about native Americans in middle school, how they would comfort and pray for the spirit of an animal they took down, thanking God for the sacrifice. As weird as it was, I felt this way for the mouse. It was a life that was ending. I don't think he had a soul, but he had life. And life is incredibly valuable. As a human I can't create it, I can only take it. That feels like a cosmic inequity to me. I don't like ending something that I can't begin. He was still now. His body was at peace. He returned to the dust. I turned around and announced, "I got him. He's dead." They all cheered, I was the conquering hero. In my mind, the whole situation just seemed ironic. The mouse had evaded every trap, and I'd killed him with gravity. It was death from above. He never saw it coming. I really don't like wielding that kind of power. I'd killed him. I carefully manipulated the stove and gas line so that I could squeeze into the space. I knelt down and took his tail between my right thumb and fore-finger. I held him up for the family to see. His left eye googled out from his skull and blood dripped from his mouth. I'd crushed him pretty good. It was a fair kill. He had to go. As I held him up I felt like I had accomplished something, and it made me laugh. It wasn't the first critter I'd killed, there was an earlier mouse, I'd shot a squirrel once, and caught a few fish. But this was an animal of intellect. He had become an adversary. I wasn't able to outsmart him. I had to kill him like a caveman. We turned out the lights and went to dinner. I told of my conquest and tucked into bed that night feeling satisfied that our food was safe and the kitchen wouldn't smell like mouse pee the next morning. I laid there looking at the night sky outside the window. The stars were bright and I could see the city below. After some time I realized I was thirsty and I made my way down to the kitchen. I turned the corner and saw a large mouse dart into the shadows. Game on mouse. Game on. For the past 5 nights we have had no evidence of active rodent activity. The month long campaign has officially come to a close with the finding of the final player, Reina Gran Ratón. 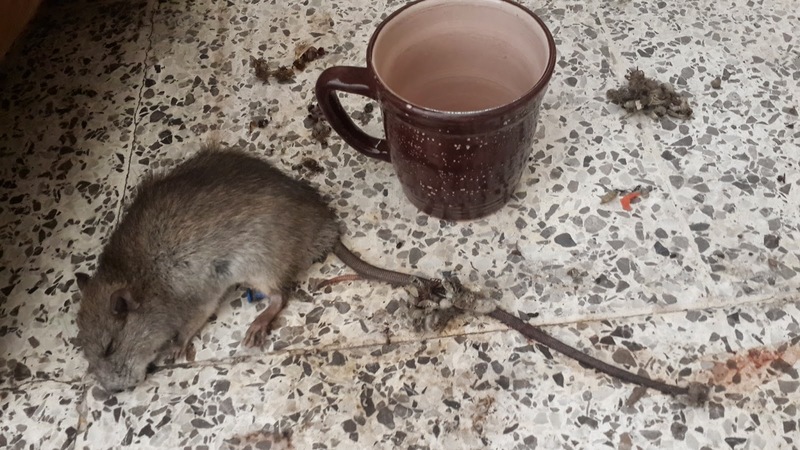 An apparent victim of rat poison, she finally yielded to death 5-6 days ago and met her end underneath our dish cabinet. Her remains were located by olfaction. 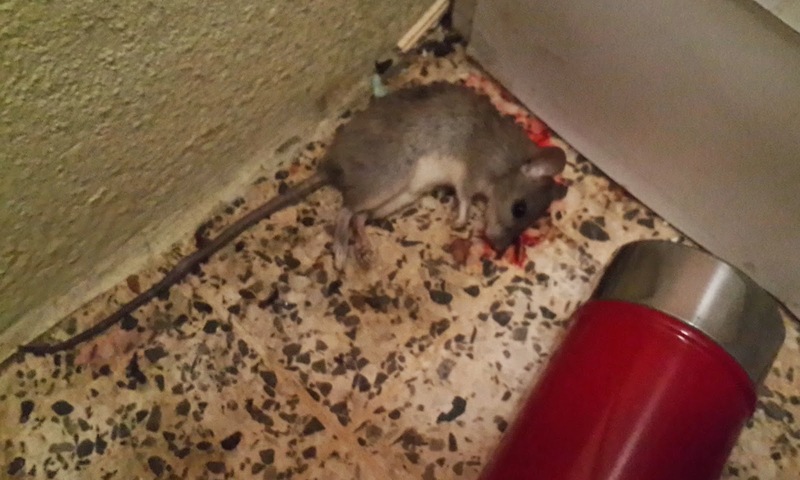 Confirmed kill #12, the end of rodent activity. Dead on a 1 foot square tile. Length from nose to tail, an astounding 15 inches!